Westiva 2015: an event for econobox fans! On July 11th we will be hosting Westiva 2015. This will be the seventh time we've held this event with the first being in 2008. 2008 attendees with 'The Wedge' in the background. The meet is held at the picturesque Wedge Pond Day Use Area in beautiful Kananaskis Country. The "official" start time is around 10:00am. 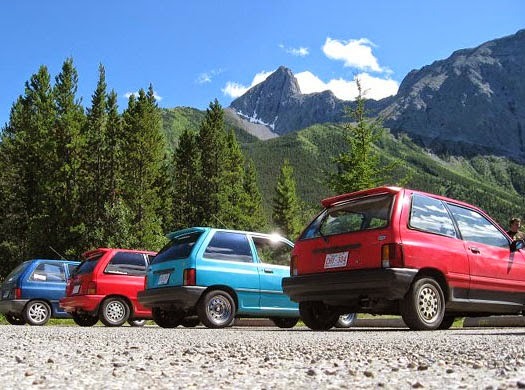 At about 1:00pm we’ll cruise up to the Boulton Creek Trading Post in Peter Lougheed Provincial Park for ice cream, about a 30km drive. From there we'll continue to Upper Kananaskis Lake. When Westiva was first held in 2008 there were four attendees. Two from Calgary, one from the lower mainland of British Columbia and the fourth driving up from Worland WY. Our best year attendance-wise was 2010 when we had 10 Festivas show up with the furthest being from Ontario. This year we already have owners bringing the cars from as far away as Pasco WA and St. Albert SK. The 2014 event saw a couple of Suzuki Swifts in attendance, one from Calgary and the other from Spruce Grove AB. So consider yourself invited! I hope to have my new Festiva project car done in time for the meet. While looking over some more road trip articles I came across another stretch of highway to add to the bucket list that's not too far from home. The Beartooth Highway is a stretch of US Highway 212 that runs from Red Lodge MT through the Absaroka-Beartooth National Wilderness, reaching elevations nearing 3350m (11,000ft), to Cooke City MT and the northern entrance of Yellowstone National Park. Charles Kuralt called this the most beautiful highway in America. It even has its own website which features a 20 minute video. Red Lodge is about nine hours south of our home in Calgary. It would be quite the trip if we first headed directly for the Beartooth and then made our return trip up through the Going To The Sun Highway and southern Alberta's Cowboy Trail both of which I've written about in earlier posts. This makes for a 2300km (1400mile) round trip. "Thanks to the interstate highway system, it is now possible to travel across the country from coast to coast without seeing anything." Here's to backroads and less traveled routes! If you've driven the Beartooth please leave a comment!